Agility Web Explorer is the new browser-based technology from WiSys. This new tool takes our popular Agility Explorer grids to the internet and extends the functionality of WiSys, and Macola, to any device. Now you can decide which device is right for the job. Like other WiSys solutions, Agility Web Explorer works with all versions of Macola ERP – Progression, ES and Macola 10. So far WiSys applications have run on handheld scanners and desktop PCs. However you may need to view Macola information or record transactions out of the office or in a remote warehouse. Agility Web Explorer makes this possible in real-time. Now you can use WiSys to run Macola transactions anywhere. Watch a webinar to learn more! Just like Agility Explorer for the desktop, you can move fields around to fit your needs. 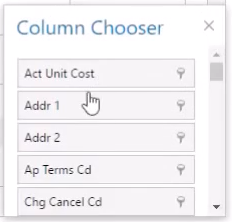 You can then use the column chooser under layout to add or remove fields by simply dragging and dropping. There are a number of ways to filter. Typing into the top row allows you to filter within each column. There is also a filter builder to refine your search even more. Grouping allows you to group information by field. 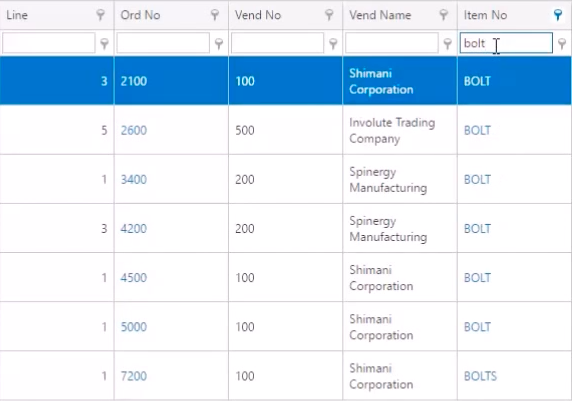 The column editor allows you to change the names of fields. Browsers are responsive with information. As the screen size changes the information displayed will be resized to fit the screen. Different field and column layouts can be saved for later use and to share with other people. What sets Agility Web Explorer apart is its ability to actually do Macola transactions, not just view the information. Information can be exported to Excel or pdf.